A frosted proof encapsulated Royal Canadian Mint collector coin celebrating the 200th anniversary of Sir Alexander Mackenzie's voyage to Canada. This .500 silver coin includes the information certificate, the plush fitted leatherette case and the cardstock outer sleeve. it is in mint as issued condition. All items are thoroughly and conservatively graded and all condition issues are noted. Small packet air shipping to the U.S. starts at $9.50 (other spots may vary). Items paid with a credit card will be shipped to confirmed addresses only. We do ship internationally. All of our prices are in $US. PLEASE NOTE: We DO NOT accept PayPal, only VISA and MASTERCARD. A beautiful Canada Royal Canadian Mint 925 sterling silver (34 gram) coin issued as part of the Chinese lunar calendar commemorative series. Issued in a limited strike of 68,888 pieces this example is number 38814 and is from the Year of the Snake 1991. 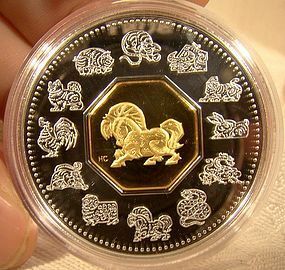 This coin includes the certificate of authenticity, the sealed, encapsulated coin with a gold plated horse inset cameo, the book-style red velvet fitted case with gold plated corners and silk lining, and the original red cardboard box. It is in excellent mint-in-box as described condition. All items are thoroughly and conservatively graded and all condition issues are noted; all items are vintage or antique and may have slight signs of gentle use. Small packet air shipping to the U.S. starts at $9.50 (other spots may vary). Items paid with a credit card will be shipped to confirmed addresses only. We do ship internationally. All of our prices are in $US. PLEASE NOTE: We DO NOT accept PayPal, only VISA and MASTERCARD. 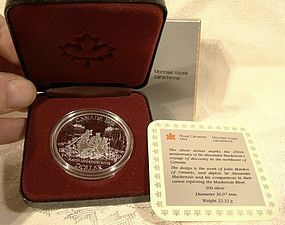 A beautiful Canada Royal Canadian Mint 925 sterling silver (34 gram) coin issued as part of the Chinese lunar calendar commemorative series. Issued in a limited strike of 68,888 pieces this example is number 13858. This coin includes the certificate of authenticity, the sealed, encapsulated coin with a gold plated horse inset cameo, the book-style red velvet fitted case with gold plated corners and silk lining, and the original red cardboard box. It is in excellent mint-in-box as described condition. All items are thoroughly and conservatively graded and all condition issues are noted; all items are vintage or antique and may have slight signs of gentle use. Small packet air shipping to the U.S. starts at $9.50 (other spots may vary). Items paid with a credit card will be shipped to confirmed addresses only. We do ship internationally. All of our prices are in $US. PLEASE NOTE: We DO NOT accept PayPal, only VISA and MASTERCARD. A true prize and a wonderful gift or addition to your collection. 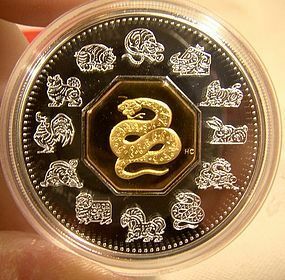 This is the 1998 Canadian Year of the Tiger Canada Post limited edition presentation package, issued as part of the Lunar Animal series of coins commemorating the Chinese lunar calendar. This is the first of the issues and it is still sealed with the original $88.88 price sticker. The set includes: $15 sterling coin with 24k yellow gold plated inset cameo (frosted proof strike), stamp souvenir sheet, text information sheet, presentation album and a numbered certificate of authenticity. 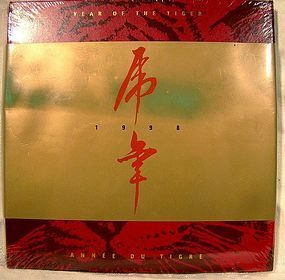 Only 8000 were issued and here is a rare chance to get a sealed example. This item is in perfect unopened condition. All items are thoroughly and conservatively graded and all condition issues are noted. Expedited tracked and insured parcel shipping to the U.S. starts at $23 (other spots may vary). Items paid with a credit card will be shipped to confirmed addresses only. We do ship internationally. All of our prices are in $US. PLEASE NOTE: We DO NOT accept PayPal, only VISA and MASTERCARD. CANADA 150th ANNIVERSARY POSTAGE STAMP COIN SET Sealed! 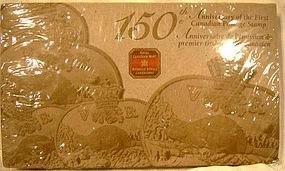 A fine and collectable Royal Canadian Mint 2001 coin set commemorating the 150th anniversary of the first Canadian postage stamp. This great gift set includes a crimson coloured leatherette case with a fitted plush interior, a 1991 postage stamp depicting the reissue of the 3 penny beaver stamp from 1851, a fancy 3 cent beaver medallion/coin with Queen Elizabeth on the obverse, a gold plated replica of the original stamp and a numbered certificate of authenticity all in a pictorial slipcase. We have two of these still sealed in their original shrinkwrap - the price is for one set only. This item is in excellent condition as described and all items are thoroughly and conservatively graded and all condition issues are noted. Small packet air shipping to the U.S. starts at $9.50 (other spots may vary). Items paid with a credit card will be shipped to confirmed addresses only. We do ship internationally. All of our prices are in $US. PLEASE NOTE: We DO NOT accept PayPal, only VISA and MASTERCARD. 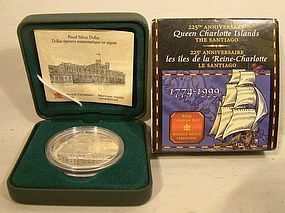 An ecapsulated Royal Canadian Mint 1999 proof silver dollar issue to commemorate the 225th anniversary of the sighting of the Queen Charlotte Islands. This coin comes complete with the information pamphlet, the fitted plush and leatherette green hinged case and the cardboard sleeve. This coin is in excellent as issued condition with no losses, damage or repairs other than a touch of bruising to the corners of the sleeve. All items are thoroughly and conservatively graded and all condition issues are noted; all items are vintage or antique and may have slight signs of gentle use. Small packet air shipping to the U.S. starts at $9.50 (other spots may vary). Items paid with a credit card will be shipped to confirmed addresses only. We do ship internationally. All of our prices are in $US. PLEASE NOTE: We DO NOT accept PayPal, only VISA and MASTERCARD. 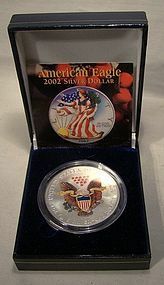 A 2002 American Historical Society painted .999 silver American Eagle silver bullion dollar coin in the original case with letter of authenticity. The 1-1/2" encapsulated coin is colourized on both sides and it is in the original as issued condition. This item is in excellent as issued condition with no losses, damage or repairs. All items are thoroughly and conservatively graded and all condition issues are noted; all items are vintage or antique and may have slight signs of gentle use. Small packet air shipping to the U.S. starts at $9.50 (other spots may vary). Items paid with a credit card will be shipped to confirmed addresses only. We do ship internationally. All of our prices are in $US. PLEASE NOTE: We DO NOT accept PayPal, only VISA and MASTERCARD. 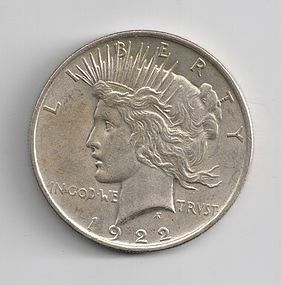 A nice 1922 United States silver Peace dollar $1 coin in EF condition. It has nice detail especially on the obverse. All coin and banknote gradings are subjective and are included as guides only, and are based on published grading charts. Please refer to the hi-res scans included in our listings for accurate sight grading of our items. All scans are sized only and they are absolutely unaltered and unenhanced. All items are thoroughly and conservatively graded and all condition issues are noted. Tracked packet air shipping to the U.S. is $14 (other spots may vary), other shipping options are available. Items paid with a credit card will be shipped to confirmed addresses only. We do ship internationally. All of our prices are in $US. PLEASE NOTE: We DO NOT accept PayPal, only VISA and MASTERCARD. 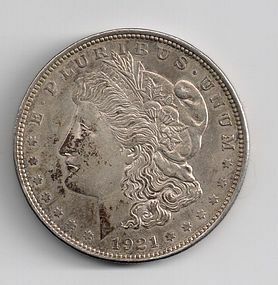 A nice 1921 United States Morgan silver dollar $1 coin in EF condition. It has nice detail and it has some facial toning. All coin and banknote gradings are subjective and are included as guides only, and are based on published grading charts. Please refer to the hi-res scans included in our listings for accurate sight grading of our items. All scans are sized only and they are absolutely unaltered and unenhanced. All items are thoroughly and conservatively graded and all condition issues are noted. Tracked packet air shipping to the U.S. is $14 (other spots may vary), other shipping options are available. Items paid with a credit card will be shipped to confirmed addresses only. We do ship internationally. All of our prices are in $US. PLEASE NOTE: We DO NOT accept PayPal, only VISA and MASTERCARD. 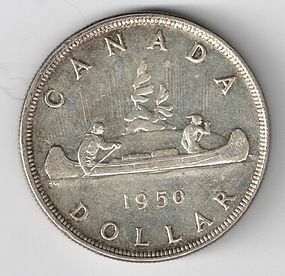 A nice 1949 Canadian silver dollar $1 coin in MS60 condition. It has superb detail and and it retains its complete mint luster (please note that our scans don't show the luster particularly well - it is vivid and attractive). A prize in this condition. All coin and banknote gradings are subjective and are included as guides only, and are based on published grading charts. Please refer to the hi-res scans included in our listings for accurate sight grading of our items. All scans are sized only and they are absolutely unaltered and unenhanced. All items are thoroughly and conservatively graded and all condition issues are noted. Tracked packet air shipping to the U.S. is $14 (other spots may vary), other shipping options are available. Items paid with a credit card will be shipped to confirmed addresses only. We do ship internationally. All of our prices are in $US. PLEASE NOTE: We DO NOT accept PayPal, only VISA and MASTERCARD. 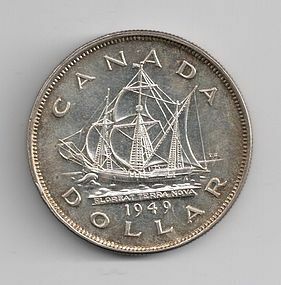 A nice 1939 Canadian silver dollar $1 coin in AU condition. It has good detail and and it retains lots of its luster especially on the obverse (luster does not show particularly well on our scans). All coin and banknote gradings are subjective and are included as guides only, and are based on published grading charts. Please refer to the hi-res scans included in our listings for accurate sight grading of our items. All scans are sized only and they are absolutely unaltered and unenhanced. All items are thoroughly and conservatively graded and all condition issues are noted. Tracked packet air shipping to the U.S. is $14 (other spots may vary), other shipping options are available. Items paid with a credit card will be shipped to confirmed addresses only. We do ship internationally. All of our prices are in $US. PLEASE NOTE: We DO NOT accept PayPal, only VISA and MASTERCARD. 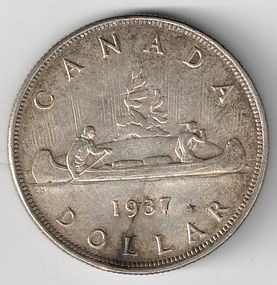 A nice 1950 Canadian silver dollar $1 coin in AU condition. It has good detail and and it retains most of its luster especially on the reverse (luster does not show particularly well on our scans). All coin and banknote gradings are subjective and are included as guides only, and are based on published grading charts. Please refer to the hi-res scans included in our listings for accurate sight grading of our items. All scans are sized only and they are absolutely unaltered and unenhanced. All items are thoroughly and conservatively graded and all condition issues are noted. Tracked packet air shipping to the U.S. is $14 (other spots may vary), other shipping options are available. Items paid with a credit card will be shipped to confirmed addresses only. We do ship internationally. All of our prices are in $US. PLEASE NOTE: We DO NOT accept PayPal, only VISA and MASTERCARD. 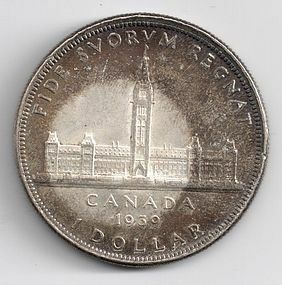 A nice 1937 Canadian silver dollar $1 coin with the double strike HP in VF+ condition. It has good detail and it is a nice example. All coin and banknote gradings are subjective and are included as guides only, and are based on published grading charts. Please refer to the hi-res scans included in our listings for accurate sight grading of our items. All scans are sized only and they are absolutely unaltered and unenhanced. All items are thoroughly and conservatively graded and all condition issues are noted. Tracked packet air shipping to the U.S. is $14.00 (other spots may vary), other shipping options are available. Items paid with a credit card will be shipped to confirmed addresses only. We do ship internationally. All of our prices are in $US. PLEASE NOTE: We DO NOT accept PayPal, only VISA and MASTERCARD. 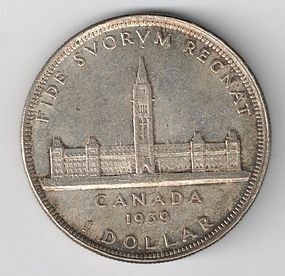 A Canadian one dollar silver dollar coin ($1) dated 1939. This King George VI Parliament Building commemorative features unusual toning, with the untoned imprint of a quarter on the reverse. This coin was in a box in an estate for decades, and we rate this coin to be in EF condition. All coin and banknote gradings are subjective and are included as guides only, and are based on published grading charts. Please refer to the hi-res scans included in our listings for accurate sight grading of our items. All scans are sized only and they are absolutely unaltered and unenhanced. All items are thoroughly and conservatively graded and all condition issues are noted. Lite packet air shipping to the U.S. starts at $4.50 (other spots may vary), other shipping options are available. Items paid with a credit card will be shipped to confirmed addresses only. We do ship internationally. All of our prices are in $US. PLEASE NOTE: We DO NOT accept PayPal, only VISA and MASTERCARD.